Rain, rain go away! Hurricane Patricia (or, what's left of her) has been making its way across our area for the last few days, and although my plants are grateful, it certainly makes getting decent quilt photos impossible. I had to settle for snapping a few inside pics of my latest finish since this quilt needs to be delivered to its new home soon. Even as a rival team fan, I have to say that I like how this one turned out. The team fabric is subtle, and the pattern is modern and masculine enough for its recipient. 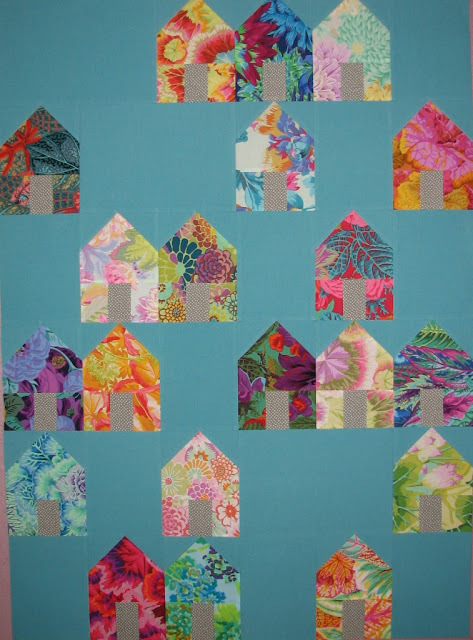 I used the partial squares that were left over on the back, along with chambray. 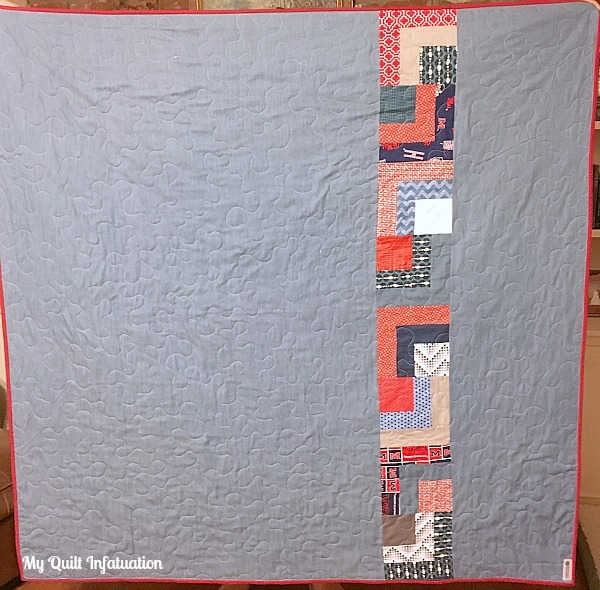 In general, when I make a quilt for a man (or boy), I try to keep the backings pretty simple but still interesting, and I love using chambray for them. It's 57 inches wide, so that makes it really easy to just add a small strip of scraps and call it done; and what man do you know that doesn't like denim? The binding on this one is Kona Rich Red, which I had left over from my Truffles quilt. The finished quilt measures 62" square, which is a weird measurement for a quilt that is eight blocks across. It's because the starting blocks finish at 16.5," which are then cut into fourths, making them 8.25" before sewing, and finishing at 7.75." Clear as mud, right? 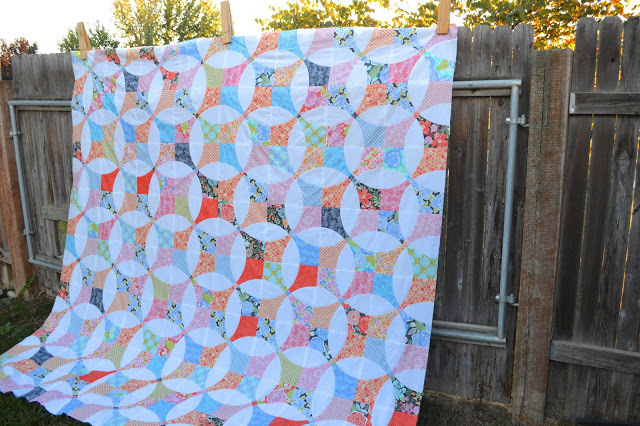 Jayne from Twiggy and Opal linked up this cool quilt using her Denyse Schmidt stash. and Micki at 2 Dogs Studio shared this fun little quilt. This is a great way to show off little sampling of large, bold prints! Okay, friends! Time to link up your latest projects! I had hoped to join you this month, but will wait until November in hopes that my mother's health is more settled. Love what you have posted, especially the first pic. I'm definitely going to make this pattern. Go team! 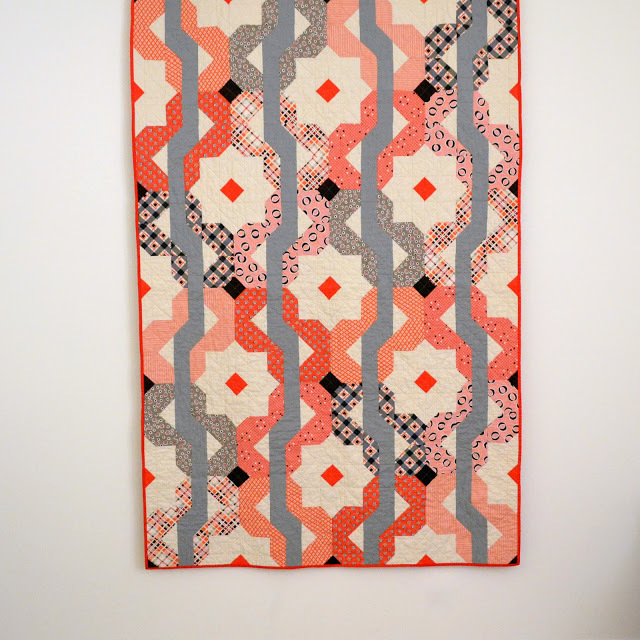 Thanks for highlighting my Denyse Schmidt quilt! I think the team quilt turned out great! It's a fun pattern and really good one for a guy! 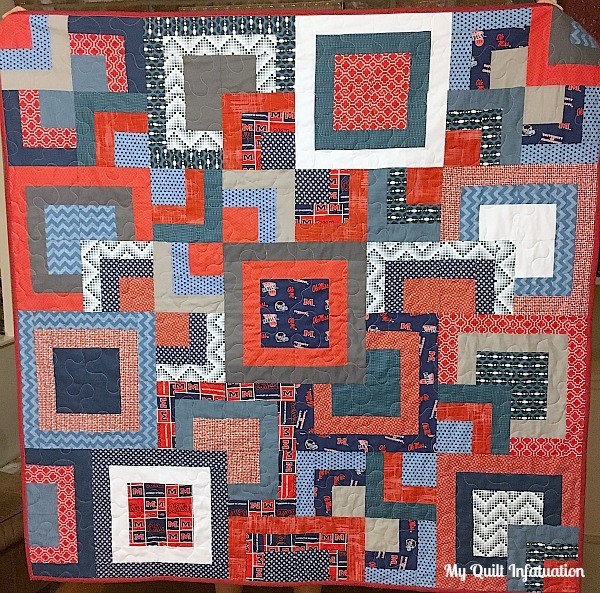 The quilt I've entered was inspired by you and created using your wonderful tutorial for the Easy Peasy Chevron quilt and it certainly was! I can't wait to have time to make another. Thanks for everything.